The new ZX190W-6 features an efficient FT4 Isuzu engine with improved piston design allowing particulate matter to burn in cylinder during combustion. This eliminates the need for regenerations or a DPF, saving service time and lowering operating costs. The next generation of Hitachi's wheeled excavator, the ZX190W-6, is rolling out with a certified Final Tier IV (FT4)/EU Stage IV Isuzu engine that does not need a diesel particulate filter (DPF) and includes multiple other upgrades that enhance efficiency, reliability and durability. Mobile and maneuverable, Hitachi's wheeled excavator weighs in at 45,300 lbs. (20,548 kg) and sits on a short wheelbase that makes it easy to work in tight spaces, according to the manufacturer. The new ZX190W-6 features an efficient FT4 Isuzu engine with improved piston design allowing particulate matter to burn in cylinder during combustion. This eliminates the need for regenerations or a DPF, saving service time and lowering operating costs. With the improved FT4 technology, Hitachi also was able to maintain or reduce total fluid consumption compared to Interim Tier IV models. The model's HIOS IV hydraulic system contributes to fuel efficiency by delivering on-demand performance and the right amount of pump flow when metering pilot controls. Additionally, power and performance is balanced with three work modes. Economy (ECO) maximizes fuel efficiency while delivering an enhanced level of productivity. Power (PWR) delivers a balance of power and speed, plus fuel economy for normal operation. 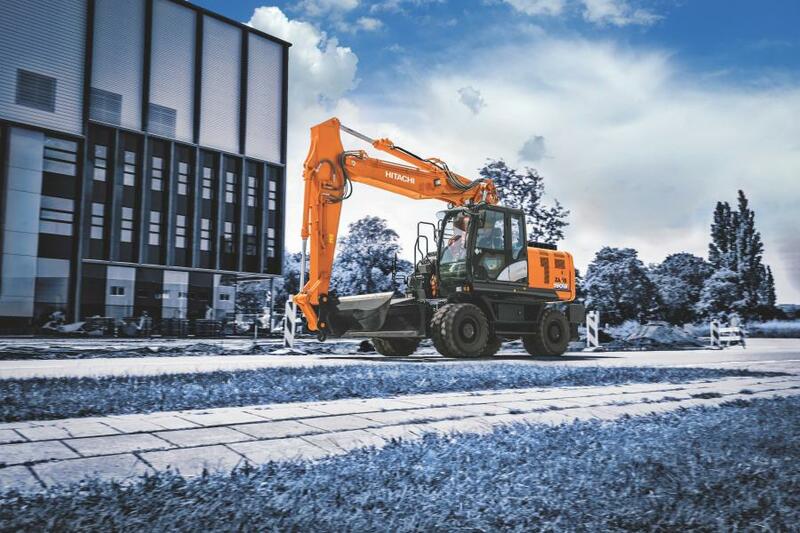 High Productivity (H/P) delivers more power and faster hydraulic response. The pavement-friendly ZX190W-6 reaches speeds up to 21.7 mph (35 kmh) and features a larger hood with springs, providing highly efficient access to the engine for service. Maintenance is minimized with the ZX190W-6 — from at-a-glance gauges to grouped service points with easy access to the washer tank, air cleaner, DEF tank and battery disconnect switch. Convenient upperstructure handrails now come standard and provide easy engine access, and extended service intervals help maximize uptime. For more information, visit http://www.hitachiconstruction.com/products/zx190w-6/.